EBay and the illegal looting of antiquities, on the Freakonomics blog. Yale theft in our own Noah Charney’s back yard, via the Yale Daily News. Victoria, BC, gallery art heist, plus photos of the perp. Publishers Weekly interview with Myles Connor. NY Review of Books: Discussion of international art and antiquities law, here. The Italian state recently purchased a $4.2 million carved linden-wood crucifix by Michelangelo that probably isn’t by Michelangelo. In an of cut budgets and economic crisis, such as purchase might seem frivolous. Then again, Michelangelo drawings have sold for $20 million, so perhaps this is a good deal? The main problem is that few experts seem to think that this could possibly be the work of Michelangelo. The lovely crucifix (the cross of which is missing) is dated circa 1495, when Michelangelo would have been only twenty. Some say that its delicacy is distinctive, and bears a likeness to Michelangelo’s Vatican Pieta, made when the artist was twenty-four. But most scholars worldwide cite a number of concerns regarding the attribution to Michelangelo. One, there is no known wooden sculpture by Michelangelo in existence. A crucifix from 1492 at Santo Spirito in Florence is thought by some to have been one of Michelangelo’s earliest works, but this is unconfirmed and far from the general consensus. Two, Michelangelo’s many biographers, in particular the man who idolized him, Giorgio Vasari (whose famous biography of Renaissance artists, The Lives of the Artists was written so as to feature Michelangelo as the culmination of centuries of artistic geniuses, the chapter on Michelangelo being many times longer than any other artist) does not mention either the construction of this crucifix or any work in wood by Michelangelo. It is true that half to two-thirds of all artworks by pre-Modern artists that we know once existed (from references to them in contemporary documents, contracts, diaries, biographies, etc) are considered “lost:” a piece of optimistic art historical terminology that suggests that the works might have been destroyed or just might be found—so the re-emergence of works by great artists is entirely plausible. However it is rare indeed that a work that is never mentioned in any extant document should suddenly appear. This debate raises interesting questions about the value of artworks. The value of art is non-intrinsic—unlike jewelry, the component parts of which are of quantitative value, art is usually wood and canvas and stone that, without the craftsmanship of the artist, would have little or no value. A pile of wood and canvas and pigment is worth little, but assembled into a painting by Picasso, it is worth millions. There is a good deal of non-malevolent wishful thinking on the part of members of the art world. The art world as a whole benefits if objects newly on the market prove to be both authentic and legally-acquired (read as “not stolen”). The owner makes a fortune in selling their treasure. The middle man (dealer, gallery owner, auction house) gets a commission. The buyer gets a trophy. Scholars get a new treasure to study, the public a new bauble to admire. If the work in question turns out to either be a fake, misattributed, or stolen, then everyone loses out—the only beneficiary is an abstract sense of justice having been done, the truth having emerged, to the financial loss, and loss of face, of many. 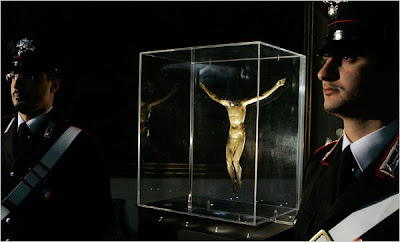 There is, therefore, a subconscious desire on the part of much of the art world to will works like this crucifix to be by the hand of master artists. On the other hand, the skeptics, particularly academic skeptics, can make a name for themselves by denouncing the optimistic attribution. When it comes down to it, the value of works of art is a combination of authenticity, demand, and rarity—but the key to all components is that value equals perceived authenticity, plus perceived demand, plus perceived rarity. Because of the non-intrinsic value of art, perception is everything. This often results in interesting tugs-of-war between various scholars and members of the art trade. And a new treasure by one of the greatest artists who ever lived hangs in the balance. The Crimes of Paris: A True Story of Murder, Theft, and Detection by Dorothy and Thomas Hoobler (Little, Brown and Company, 2009) professes to tell the real inside story of the theft of the Mona Lisa and begins by mis-spelling the name of the thief. 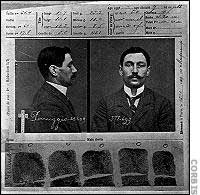 Vincenzo Peruggia spells his name with two “gs,” as may be seen in the widely-published mug shot taken of him by Italian police, after his arrest as he tried to return the Mona Lisa to Italy, after having stolen it from the Louvre. It is rather baffling, then, that the authors of this new work of non-fiction chose to spell the thief’s name with only one “g.” The odd choices do not stop there. It is perhaps surprising that the complete story of the theft of the Mona Lisa, certainly the most famous art theft in history, has never been the subject of a book of non-fiction. It is mentioned in a number of works, but an in-depth monograph is still wanting. The Crimes of Paris professes to fill that lacuna, and its publishers were optimistic—an excerpt was featured in the May 2009 issue of Vanity Fair. (Another new book of 2009, Vanished Smile by R. A. Scotti, also hopes to tell the story—we’ll see if the author can do better). While the account of the theft and recovery of the Mona Lisa is accurate and reasonably well-written, the supposed true crime conspiracy that the authors have uncovered and present in their work, regarding forgeries of the Mona Lisa and a mastermind called the Marquis de Valfierno who was behind the whole plot, is a load of hooey. The sole source of this conspiracy, a 1932 article in The Saturday Evening Post by American journalist Karl Decker, was dismissed decades ago by all scholars worthy of the name as a wholesale invention—and one so outrageous that it is difficult to understand how anyone could believe it to be true. Decker claimed to have met a con man named Eduardo while in Casablanca. Eduardo proceeded to tell Decker about his forgery ring in Buenos Aires and Paris, selling American millionaires copies of paintings that he told them were stolen originals. This Eduardo, who also went under the alias the Marquis de Valfierno, claimed that he had hired Peruggia to steal the original Mona Lisa in order to convince six separate American millionaires that the forged Mona Lisa that they were buying from Valfierno was the stolen original. The Valfierno story was long ago rejected as one of two things: either a wholesale invention by Karl Decker to sell his story, or a wholesale invention by a con man in Casablanca that pulled the wool down over Mr Decker’s eyes. It is a shame, then, that a work of non-fiction professing to tell the true story behind a famous true crime, should so mislead its readers. Without the addition of myth, the story of the theft of the Mona Lisa is rich and enthralling, with a fabulous cast of characters (including Picasso, Apollinaire, and a fascinating French detective), the backdrop of pre-war Paris and Florence, and ripples felt to this day. For not only was the theft of the Mona Lisa the most famous theft of any object in history, but it also inspired other thefts, altered the concept of what makes a work valuable, and proved to be a turning point in the history of art, of collecting, and of art crime. The book is worth reading for its solid if stolid account of the theft and recovery of the world’s most famous painting. It also covers the backdrop of Paris in the ‘teens, with a variety of characters sketched into what is more a pastiche of a period in time than a thorough exploration of one crime. In terms of setting the scene, painting the atmosphere of a time and place, the book succeeds nicely. But it is, of course, the art crime that is of greatest interest to this review. The Hooblers’ tale of the Mona Lisa theft would have done well to have ended without the addition of Valfierno—and it would have been nice to have spelled the name of the protagonist correctly. Trying to shoe-horn a myth into one of history’s great true stories poisons the portions that are true, and cultivates the misconceptions about art crime that already abound.